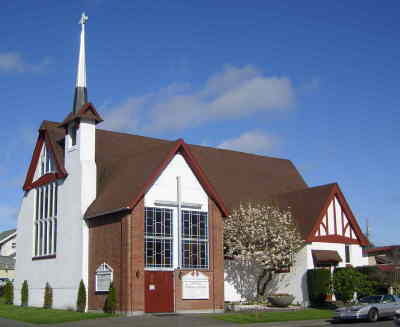 Trinity Lutheran Church, Everett, is a Place of Grace- a place where God's unconditional love is experienced and lived out in community. It's a place where one can grow in an understanding of God's love for all people and where that love can be shared with one another, with the wider community and the world. Many opportunities for learning, fellowship, and service are offered for all ages. People of all backgrounds, colors, sexual orientations, gender identities, addictions, economic classes, languages, mental or emotional states, talents, marital status, parents, children (quiet & noisy), adults (discreet or nosy), sons, daughters, youngsters, oldsters, all states of health, religious beliefs, responsible or flaky, true blue or straying, obedient or disobedient, happy, sad, lonely, mad or searching. ALL OF US have sinned and fallen short of the glory of God. We are saved by the GRACE of our Lord Jesus Christ who died for US. Christ does not wait to love us until after we show signs of "getting it together." Jesus loves us all unconditionally though we are yet sinners. Like Him, we proclaim God's forgiveness and strive to carry His love to a broken and hurting world of which we are a part. Come in! We look forward to seeing you often! Click on the links to discover more about our ministry.